Discover all the benefits orthodontic care offers your teen with Dr. Pennella and his friendly team at The Braces Place. Using all the latest and most advanced orthodontic technology, we offer our teenage patients a variety of care options to ensure they receive the best orthodontic treatment for their growing smiles! At The Braces Place, your teen is given many great options for improving his or her smile including Invisalign Teen, clear braces, metal braces, and self-ligating braces. The permanent teeth have come in. 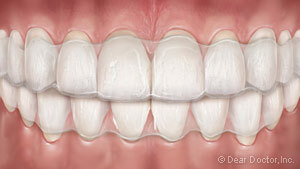 During adolescence, the primary teeth have all been replaced with the permanent teeth. This is when Dr. Pennella can correct common problems like improperly spaced teeth, “bad bites,” and misaligned teeth. It’s easier to treat many problems during the teenage years. Because the jaw and bones of the face are still developing during adolescence, it is easier for your Lexington orthodontist to treat problems during this stage of life due to rapid body growth. Once the facial bones and jaw are done developing, many orthodontic conditions become more difficult and costly to treat. Wearing braces is common among teenagers. It’s very common to see teens wearing braces or aligners on their teeth. In fact, when your teen is visiting us to improve his or her smile, it’s likely that he/she will see a few classmates or friends in our office. Once your teen is finished wearing braces or Invisalign Teen, he/she can enjoy all the benefits that come with having a lifelong, healthy and attractive smile. The treatment plan Dr. Pennella develops for your teen may involve wearing conventional metal braces with or without elastics. Dr. Pennella may also recommend another treatment method that meets your teen’s needs, all depending on what he finds during the initial examination. 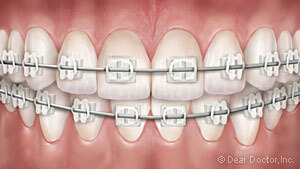 These are the types of braces most people are familiar with. 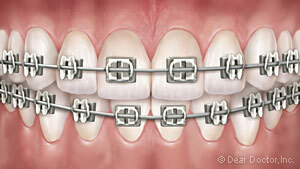 Compared to the metal braces used years ago, today’s metal braces are smaller, more comfortable, and more attractive. These braces which are made up of stainless steel bands, brackets, and wires, are bonded to the teeth for the duration of the treatment process. 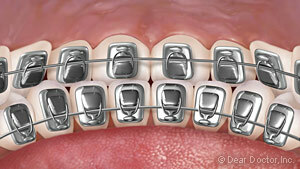 The clear braces we use are great for teens who don’t want to wear highly visible metal braces. Made of a translucent material, clear braces are very discreet. Like conventional metal braces, clear braces are bonded to the teeth for the entire time your teenager is improving his or her smile. We offer several types of clear braces including clear ceramic braces, Inspire braces, and Clarity braces. This is one of the most popular treatment choices among teens for many good reasons. Unlike metal or clear ceramic braces that are bonded to the teeth, Invisalign Teen consists of a sequence of custom-made, removable aligner trays that move the teeth. The aligners have tiny compliance indicators built right in to show your teen, you and the orthodontist whether or not the aligners are being worn as directed. These braces offer the most unnoticeable form of orthodontic treatment because they are attached to the back (tongue side) of the teeth, where they cannot be seen at all. Dr. Pennella may recommend other orthodontic appliances and especially if your teen requires significant tooth or jaw movement. These appliances can range from small oral devices that are fitted inside the mouth to external headgear. Most teenagers spend anywhere from six to 30 months in treatment. The exact amount of time your teen will spend wearing braces or Invisalign depends on the severity of the orthodontic problem your teenager has. When your teen is finished with treatment, he or she will begin what’s called the retention phase of treatment. This is when we will give your teen a custom-made retainer to wear that’s designed to hold his or her teeth in their new positions. At The Braces Place, many of our patients are teenagers who are working on achieving their most perfect smiles! If you have any questions about adolescent treatment, please feel free to contact us as we’re always happy to speak with you! To set up your teen’s first complimentary consultation with Dr. Pennella, please request an appointment today. We look forward to seeing you and your teen soon in our orthodontic office in Lexington, SC!